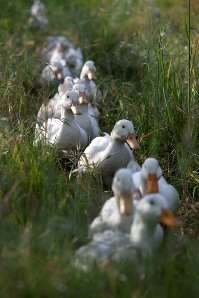 There once was a posse of ducks – Pekin Ducks! Our fantastic new wines from South Africa are made from organically grown grapes on an eco-friendly estate in the picturesque Paarl region of the Cape Winelands. The lovely little ducks are released daily to roam the vineyards, eating all the snails and other harmful pests , working with nature in the natural vineyard eco-system, as a highly effective and eco-friendly way to avoid using harmful chemicals. 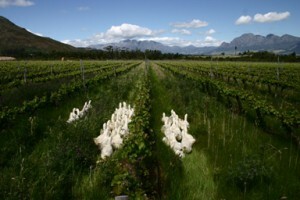 Jonathan Grieve, also known as Jonty, owner of Avondale Wines, has created these wonderful, premium quality, blended wines and named them after his beloved ducks. Call us today to place your order and try these fabulous wines!.